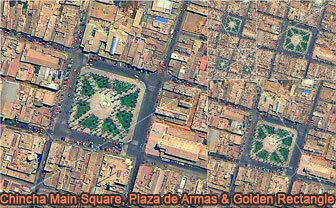 The City of Chincha Alta is located 200 kilometers south of Lima, in the Chincha Province of the Ica Region of Peru. The first inhabitants of the area arrived at the beginning of the ninth century. These people are known as the "Pre-Chincha". In the eleventh century, a more advanced and warlike people known as the Chincha arrived in the coastal area. The Chincha had developed systems of architecture, agriculture and irrigation. The Chincha came to dominate the original inhabitants of the area. Some aspects of the original Pre-Chincha culture were absorbed by the newcomers. The word Chincha is derived from "Chinchay" or "Chinchas" or "Cinca" which mean "Jaguar" in the native language. Between 1458 and 1460, the Chincha were conquered by the armies of the Inca Empire led by Tupac Inca Yupanqui during the reign of his father, Pachacuti. The Chincha area became an important part of the Inca Empire, and the Inca valued the Chincha for their agricultural knowledge and military skill. Source: Wikipedia: Chincha Alta.